Ab-targeted vaccination involves targeting a receptor of choice expressed by dendritic cells (DCs) with Ag-coupled Abs. Currently, there is little consensus as to which criteria determine receptor selection to ensure superior Ag presentation and immunity. In this study, we investigated parameters of DC receptor internalization and determined how they impact Ag presentation outcomes. First, using mixed bone marrow chimeras, we established that Ag-targeted, but not nontargeted, DCs are responsible for Ag presentation in settings of Ab-targeted vaccination in vivo. Next, we analyzed parameters of DEC205 (CD205), Clec9A, CD11c, CD11b, and CD40 endocytosis and obtained quantitative measurements of internalization speed, surface turnover, and delivered Ag load. Exploiting these parameters in MHC class I (MHC I) and MHC class II (MHC II) Ag presentation assays, we showed that receptor expression level, proportion of surface turnover, or speed of receptor internalization did not impact MHC I or MHC II Ag presentation efficiency. Furthermore, the Ag load delivered to DCs did not correlate with the efficiency of MHC I or MHC II Ag presentation. In contrast, targeting Ag to CD8+ or CD8− DCs enhanced MHC I or MHC II Ag presentation, respectively. Therefore, receptor expression levels, speed of internalization, and/or the amount of Ag delivered can be excluded as major determinants that dictate Ag presentation efficiency in setting of Ab-targeted vaccination. Antibody-targeted vaccination is a new mode of vaccine delivery currently being exploited for clinical application (1–3). Ag is fused to Abs specific for a selected dendritic cell (DC) surface receptor. Direct targeting of DC receptors ensures sufficient Ag delivery directly to DCs, the cell type responsible for efficient Ag processing and presentation. Additionally, Ab-targeted vaccination enables targeting of Ag to selected DC receptors of choice, permitting control over the ensuing immune response. Currently, there is little consensus as to which receptor elicits more robust MHC class I (MHC I) or MHC class II (MHC II) Ag presentation. Individual DC receptors will differ widely in their expression levels, internalization speeds, and downstream intracellular trafficking pathways reflective of the array of functions in which they participate. How these individual parameters impact the ability of a given DC receptor to exert more superior Ag presentation outcomes in the setting of Ab-targeted vaccination is largely unknown. Effective Ag presentation results from Ag being trafficked to subcellular compartments for processing and loading into MHC molecules. Following Ag uptake, downstream intracellular trafficking routes can differ markedly in their efficiency by which MHC I and MHC II Ag presentation occurs. Specific trafficking routes that initiate more efficient MHC I or MHC II Ag presentation have not been strictly defined. For example, DEC205 (CD205), a molecule that traffics to late endosomes (4–6), is considered a superior receptor for MHC I cross-presentation (7–10). Alternatively, MHC I cross-presentation is efficiently enhanced by receptors that traffic to early, but not late, endosomes (5, 6, 11, 12). Therefore, several trafficking routes downstream of receptor internalization can promote MHC I cross-presentation. Furthermore, receptors that traffic to the same intracellular destination can differ in their Ag presentation efficiencies. This is the case for CD40 and mannose receptor that both traffic to early endosomes, yet for unknown reasons CD40 is more efficient at eliciting MHC I cross-presentation (5). Therefore, the emerging view is that receptor trafficking alone is not the sole determinant of the effectiveness of Ag presentation outcomes. Other parameters that contribute to the ability of individual receptors to elicit superior MHC I or MHC II Ag presentation remain to be defined. Speed of cell internalization is one parameter of interest that has the potential to influence receptor-mediated Ag presentation outcomes. In particular, it has been proposed that slower, more continuous Ag delivery may limit proteolysis and enable Ag presentation over an extended time period (2, 5). This has yet to be tested with definitive measurements of receptor internalization kinetics. Another parameter of potential importance in dictating the efficiency of MHC I or MHC II Ag presentation outcomes is Ag load. The amount of Ag delivered via the targeted receptor will vary as a result of receptor expression levels and the proportion of targeted receptor ultimately internalized. Intuitively, a DC acquiring a higher Ag load may be expected to display increased peptide–MHC complexes at the cell surface. This may not be the case, however, if the internalized Ag is not delivered to a compartment capable of efficient MHC loading. The role of Ag load in Ab-targeted vaccination has yet to be formally addressed. In this study, we have performed a quantitative analysis of several parameters that have the capacity to critically impact Ab-targeted vaccination. We have determined how receptor expression levels, the proportion of targeted receptors internalized, speed of Ag internalization, the amount of Ag delivered, and/or the targeted DC subsets themselves influence MHC I and MHC II Ag presentation outcomes under steady-state and inflammatory conditions. C57BL/6, OT-I, OT-II, DEC205−/− (provided by M. Nussenzweig), and Ly5.1 mice were bred under specific pathogen-free conditions at the Bio21 Institute Animal Facility or the Walter and Eliza Hall Institute Animal Facility. All experiments were conducted in accordance with guidelines provided by National Health and Medical Research Council of Australia. Experimental procedures were approved by the Animal Ethics Committees at the University of Melbourne or the Melbourne Health Research Directorate. Abs used for murine DC phenotyping, internalization assays, or Ag targeting experiments were specific for DEC205 (clone NLDC45-145), Clec9A (clone 42D2), CD11c (clone N418), CD11b (clone M1/70), and CD40 (clone FGK45.5). Additionally, Abs specific for CD8 (clone YTS.169) and MHC II (clone M5/114) were used for DC phenotyping. All Abs were generated and conjugated to fluorochromes in-house. Isotype control Abs, anti-CD16/32 (clone 93), and anti-biotin (clone 1D4-C5) were purchased from BioLegend. Abs used for human DC internalization assays were specific for CD11c (clone BU15, Abcam) and DEC205 (clone MG38, Interchim). Human DCs were phenotyped with Abs specific for CD16, CD14, CD3, and CD19 (BD Biosciences), BDCA-3 (Miltenyi Biotec), BDCA-1 (eBioscience), and HLA-DR (eBioscience). Spleens were digested with DNAse (Roche Applied Science) and collagenase (Worthington Biochemical) to generate single-cell suspensions. Light-density cells were selected using Nycodenz (Nycomed Pharma) (1.077 g/cm3). DCs were enriched by depletion of unwanted cells with rat Abs directed against CD3 (clone KT3-1.1), Thy1 (clone TER119), CD45R (clone RA36B2) and Ly6C/G (clone 1A8) and anti-rat Ig magnetic beads (BioMags from Qiagen). Enrichment yielded preparations of ∼70–90% CD11c+ cells. Where indicated, CD11c+ CD8+ and CD8− DCs were sorted to purity using a BD Influx cell sorter (BD Biosciences). Mature DCs were activated by culture overnight in media supplemented with 10 ng/ml GM-CSF (Preprotech). Human DCs were isolated from buffy coats of healthy donors obtained from the Etablissement Français du Sang. PBMCs were prepared by centrifugation on a Ficoll gradient (Lymphoprep, Greiner Bio-One). PBMCs were enriched for DCs using the EasySep human pan-DC pre-enrichment kit (StemCell Technologies) according to the manufacturer’s instructions. Fluorescence internalization probe (FIP)–azide (5′ Cy5-TCAGTTCAGGACCCTCGGCT-N3 3′) and quencher molecule (QPC; 5′ AGCCGAGGGTCCTGAACTGA- BHQ2 3′) were purchased from Integrated DNA Technologies. Abs were functionalized with Click-IT succinimidyl ester DIBO alkyne (Life Technologies) by incubating with 10-fold molar excess of succinimidyl ester DIBO alkyne for 2 h at 4°C. Functionalized Abs were purified using a Zeba spin desalting column (Thermo Scientific) and incubated with 2-fold molecular excess of FIP-azide at 4°C overnight. FIP-labeled Ab was purified using a 30-kDa Amicon filter (Merck Millipore), and the degree of functionalization was measured with a NanoDrop 1000 UV-Vis spectrophotometer. Labeling efficiency was determined as the ratio of Cy5-FIP to Ab where Ab concentration was determined by measurement of absorbance at 280 nm following subtraction of the absorbance at 280 nm signal elicited by the Cy5 probe-FIP (0.55 × absorbance at 649 nm). FIP internalization assays were performed by staining DCs on ice for 30 min with FIP-Cy5–conjugated mAbs in the presence of anti-CD16/32 (BioLegend) to block nonspecific binding of mAbs to Fc receptors. Staining was followed by two washes and incubation of FIP-Ab–bound cells in complete RPMI 1640 at 37°C, 10% CO2. Cells were removed at specific time points and placed on ice. After the time course DCs were washed, phenotyped for surface markers, and resuspended in media containing propidium iodide with or without 1 μM QPC. Murine DCs were analyzed using a BD Biosciences LSRFortessa, whereas human DCs were analyzed with a BD Biosciences FACSVerse instrument. Data were analyzed with FlowJo (Tree Star). Host mice were gamma-irradiated (2 × 0.55 Gy) and reconstituted with 1 × 106 T and B cell–depleted bone marrow of each relevant donor strain mixed at a 1:1 ratio. Chimeras were maintained on antibiotic neomycin (Sigma-Aldrich, St. Louis, MO) in the drinking water for 6 wk and were used in experiments after at least 8 wk of reconstitution. OVA-specific T cells were purified from lymph nodes of OT-I and OT-II mice. Single-cell suspensions were depleted of unwanted cells by Abs specific for erythrocytes (clone TER-119), Ly6C/G (clone RB6-6C5), MHC II (clone M5/114), macrophages (clone F4/80), and either CD4 (clone GK1.5) or CD8 (clone 53-6.7). Labeled cells were removed using anti-rat Ig-coupled magnetic beads (BioMags from Qiagen). Purity of OT-I or OT-II cells was verified to be ∼95%. Purified T cells were labeled with CFSE (Molecular Probes) or Cell Trace Violet (Invitrogen) at 37°C in 0.1% BSA-PBS. Dividing OT-I or OT-II cells were determined based on the loss of CFSE or Cell Trace Violet fluorescence and enumerated by flow cytometry using calibration beads (BD Biosciences). In vitro Ag targeting assays were performed with CD8+ and CD8− DCs sorted to purity by flow cytometry. Cells were stained with biotinylated Abs specific for DEC205 (clone NLDC45), CD11c (clone N418), and CD40 (clone FGK45) (all Abs generated in-house) on ice for 30 min, washed, and labeled with anti-biotin OVA (Miltenyi Biotec) for 30 min on ice. For DCs pulsed with OVA peptides, Ab-targeted DCs were labeled with anti-biotin Ab (BioLegend). For MHC I presentation, DCs were incubated with 1 μg/ml OVA257–264 for 45 min at 37°C, washed, and added to T cell cultures. For MHC II presentation, 10 μg/ml OVA323–339 was added directly to DC and T cell cultures. Titrated numbers of Ag-targeted DCs were cocultured with 50 × 103 Cell Trace Violet (Invitrogen) OT-I or OT-II T cells. Ag-specific division was assessed after 3 d of culture by flow cytometry. T cells were identified with Abs specific for CD4 (GK1.5), CD8 (YTS.169), and TCR Vα2 (B20.1). In vivo Ag presentation assays were performed with mice that were untreated or had received 20 nmol 1168 CpG 24 h previously. One day later, CFSE-labeled transgenic OT-I or OT-II T cells were i.v. injected into Ly5.1 or Ly5.2 disparate recipients. At the same time of T cell transfer, mice were immunized i.v. with 100 μg soluble OVA protein (Sigma-Aldrich) or 1 μg anti–DEC205-OVA Ab (13). Spleens were harvested at indicated time points. Transferred T cells were identified with Abs specific for CD4 (clone GK1.5) or CD8 (clone YTS.169) and Ly5.1 (clone A20) or Ly5.2 (clone 104). To initiate analysis of Ab-targeted vaccination, we first established whether the DC that is targeted with Ag is the DC ultimately responsible for its presentation. One possibility is that Ag targeting delivers Ag to receptor-expressing DCs, after which these DCs are captured by other (nontargeted) DCs for Ag presentation. To determine whether Ag transfer occurs during Ab-targeted vaccination, we measured outcomes of in vivo targeting of DEC205 (CD205). DEC205 is highly expressed by immature CD8+ DCs (9, 14–17). Following DC activation, low DEC205 expression is also detected for mature CD8− DCs (9, 17). The potential for DEC205-targeted Ag transfer was tested under steady-state conditions and following the induction of inflammation elicited by in vivo injection of TLR9 agonist CpG. Mixed bone marrow chimeras were established where host mice were lethally irradiated and reconstituted with a 1:1 ratio of Ly5.1 DEC205+/+ and Ly5.2 DEC205−/− bone marrow. After 8 wk of reconstitution, mice were treated (or not) with 20 nmol CpG and immunized i.v. with 1 μg anti–DEC205-OVA. Eighteen hours after immunization, DEC205+/+ or DEC205−/− CD8+ DCs were isolated and their ability to present anti–DEC205-OVA to OT-I or OT-II T cells was assessed by in vitro culture. 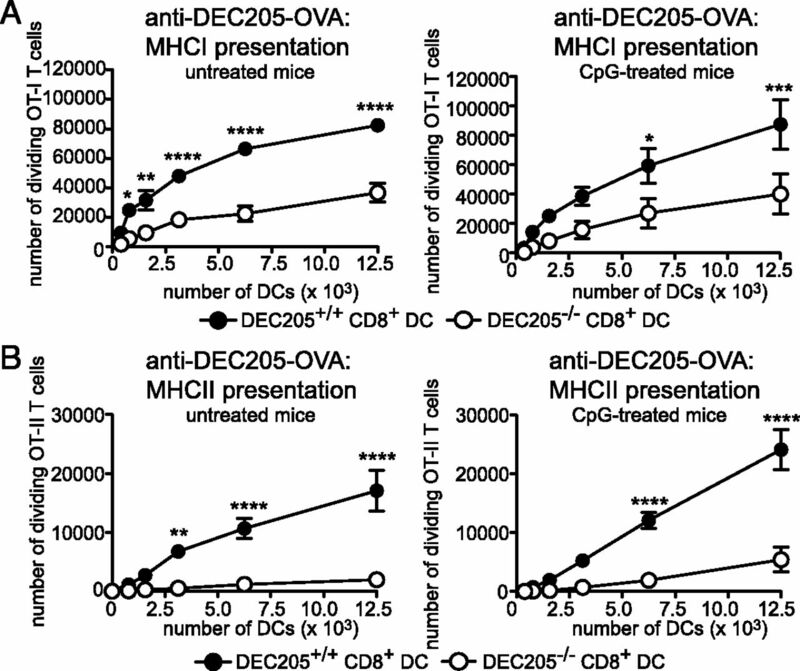 Targeted DEC205+/+ CD8+ DCs were the major presenters of DEC205-OVA by MHC I in both untreated and CpG-treated mice. A small amount of Ag presentation was elicited by DEC205−/− CD8+ DCs, suggesting that some Ag transfer to nontargeted DCs occurs; however, this is significantly lower than that elicited by targeted DCs. The contribution of nontargeted DCs to MHC I Ag presentation remained unaltered in the presence or absence of inflammation elicited by CpG administration (Fig. 1A). A similar outcome was observed for MHC II Ag presentation, where anti–DEC205-targeted DCs were responsible for Ag presentation of anti–DEC205-OVA. In this case, MHC II Ag presentation was almost undetectable by nontargeted DCs (Fig. 1B). Therefore, MHC I and MHC II Ag presentation following Ab-targeted vaccination is performed by the targeted DC itself and is not the result of Ag transfer to nontargeted DCs under both steady-state and inflammatory conditions. Targeted DCs, but not nontargeted DCs, are responsible for Ag presentation in response to DEC205-targeted Ag in vivo. Mixed bone marrow chimeras were generated by reconstituting mice with a 1:1 ratio of DEC205+/+ Ly5.1 and DEC205−/− Ly5.2 bone marrow. After 8 wk of reconstitution, mice were inoculated i.v. with 1 μg anti–DEC205-OVA in the presence or absence of 20 nmol CpG. Eighteen hours later, DEC205+/+ (●) or DEC205−/− (○) CD8+ DCs were sorted to purity and cultured with CFSE-labeled (A) OT-I or (B) OT-II T cells. The number of dividing T cells was determined by flow cytometry after 3 d of culture. Graphs display mean ± SEM of data pooled from three independent experiments performed in duplicate. Data were analyzed by two-way ANOVA followed by Bonferroni multiple comparisons. *p < 0.05, **p < 0.01, ***p < 0.001, ****p < 0.0001. Next, we measured endocytic parameters of receptors that are commonly used as DC Ag targets, including DEC205, Clec9A, CD11c, CD11b, and CD40. These receptors are expressed at different levels by immature and mature CD8+ and CD8− DCs isolated directly from the murine spleen (Supplemental Fig. 1A). To allow quantitative measurements of DC receptor internalization, we used FIP (18). FIP consists of a sense DNA strand conjugated to a fluorochrome that is attached to Abs specific for receptors of interest. Following FIP-Ab binding to the target receptor and receptor internalization, both internalized molecules and those that remain at the cell surface emit fluorescence. FIP is designed to enable elimination of signals from molecules that remain at the cell surface. This is achieved by introduction of the anti-sense DNA complementary to the FIP DNA sequence, which is conjugated to a QPC. Introduction of the QPC in close proximity to the original FIP probe fluorochrome will eliminate its signal. Therefore, the only FIP signal elicited in the presence of QPC is that which is emitted from internalized molecules. As such, the use of FIP for receptor internalization assays by flow cytometry involves detection of an increasing signal with time as cells begin to internalize surface receptors. This provides a reliable and quantitative measure of individual receptor internalization parameters. We used FIP to measure parameters of receptor internalization for DEC205, Clec9A, CD11c, CD11b, and CD40 expressed by murine primary CD8+ and CD8− splenic DCs. DCs were examined directly following isolation (immature) or after activation by overnight culture (mature). In all cases, FIP-conjugated Abs elicited specific staining relative to FIP-conjugated isotype control Abs, and surface FIP signals were efficiently turned off in the presence of QPC (Supplemental Fig. 1B). First, we examined the kinetics of DEC205 internalization (Fig. 2, Table I). Rates of DEC205 endocytosis were measured for primary murine CD8+ DCs. Approximately 80% of surface DEC205 internalized by 90 min (Fig. 2A), with the time to maximum internalization being 60 min (Table I). CD8+ DC activation significantly reduced the proportion of internalized surface DEC205 molecules, although the speed to maximum internalization was faster (Fig. 2A, Table I). In contrast to CD8+ DCs, immature CD8− DCs do not express DEC205 whereas activation elicits DEC205 expression by mature CD8− DCs (Supplemental Fig. 1A). Mature CD8− DCs rapidly internalized a high proportion of surface DEC205 within 15 min (Fig. 2A, Table I). Overall, DEC205 is a receptor with fast internalization speed and a high proportion of targeted surface molecules are internalized. A similar pattern of internalization was observed for Clec9A (also called DNGR-1), another C-type lectin that similar to DEC205 is expressed at high levels by CD8+ DCs and acts as a receptor for dead cell–associated Ags (19–21). A high proportion of surface Clec9A was internalized (Fig. 2B), with maximum internalization achieved by 60 min (Fig. 2B, Table I). Similar to DEC205, activation of CD8+ DCs resulted in significantly reduced Clec9A internalization, although in contrast to DEC205, Clec9A internalization by mature DCs was significantly slowed (Fig. 2B, Table I). Individual murine DC receptors exhibit different internalization patterns. Internalization of (A) DEC205, (B) Clec9A, (C) CD11c, (D) CD11b, and (E) CD40 was monitored with FIP for immature and mature murine spleen CD8+ and CD8− DCs. In all experiments, DCs were labeled with receptor-specific Abs conjugated to FIP at 4°C (time 0). At specific time points following culture at 37°C, cells were removed and exposed to QPC. DCs were phenotyped by staining with fluorochrome-conjugated Abs specific for (A, B, D, and E) CD11c, CD8, or (C) MHC II, CD8, and CD11b. Percentage internalization is calculated as the FIP signal at a given time point in the presence of QPC (minus signal elicited at time 0 with QPC) as a percentage of the FIP signal at time 0 in the absence of QPC (minus signal elicited at time 0 with QPC). Graphs represent pooled data from two independent experiments performed in triplicate (mean ± SD). Data were analyzed by two-way ANOVA followed by Bonferroni multiple comparisons. *p < 0.05, **p < 0.01, ****p < 0.0001. Next, we measured internalization parameters of CD11c, a component of complement receptor 4 and member of the leukocyte β2 integrin family (22). CD11c is highly expressed by all DC subsets (23) and elicits MHC I and MHC II Ag presentation following targeting with Ag in vivo (24). Analysis of CD11c endocytosis identified CD11c to exhibit strikingly different internalization parameters relative to DEC205 and Clec9A. A low percentage of surface CD11c was internalized by either immature or mature CD8+ or CD8− DCs. Less than 20% of surface CD11c had entered the cells after 90 min (Fig. 2C, Table I). Reduced receptor endocytosis was also the case for CD11b (Fig. 2D), another integrin family member (25) highly expressed by CD8− DCs (but not CD8+ DCs) (Supplemental Fig. 1A). Less than 10% of surface CD11b was internalized from the surface of immature or mature CD8− DCs within 90 min (Fig. 2D, Table I). Therefore, mechanisms of internalization of CD11c and CD11b differ considerably from those of the C-type lectins DEC205 and Clec9A, with only a small proportion of surface CD11c and CD11b internalized, and with internalization occurring via a slower pathway. Finally, we examined endocytosis of CD40, a TNF family member. CD40 was of interest given that its slow internalization properties have been suggested to be responsible for its effectiveness in targeting the MHC I cross-presentation pathway (5). CD40 internalization speed has yet to be formally measured. CD40 FIP analysis was undertaken for primary splenic DCs. Immature and mature CD8+ DCs expressed CD40, whereas immature CD8− DCs only expressed sufficient CD40 levels for analysis following activation. Both DC subsets exhibited fast CD40 turnover with maximum CD40 internalization by 30 min, irrespective of DC activation status (Fig. 2E, Table I). In summary, of the five individual DC surface receptors examined, DEC205 was exceptional in its high levels of receptor endocytosis by immature and mature DCs, both in terms of the speed of internalization and the high proportion of surface receptors internalized, relative to Clec9A, CD11c, CD11b, and CD40. Clec9A also exhibited high surface turnover and fast kinetics; however, both parameters were significantly reduced following DC maturation. CD40 exhibited fast internalization kinetics, with a lower percentage surface molecule turnover, whereas CD11c and CD11b exhibited both slow internalization and very low levels of total surface turnover. To extend our analysis of receptor internalization patterns to human DCs, we examined internalization of DEC205 and CD11c by primary human DCs, given that their murine counterparts exhibited clear differences in their endocytic parameters. Endocytosis was evaluated for BDCA-1+ and BDCA-3+ DC subsets, the two major DC subsets isolated directly from human blood (26–28). Both human DC subsets express DEC205 at low levels (Supplemental Fig. 2). Surface DEC205 was internalized by BDCA-1+ and BDCA-3+ DCs, with no significant differences for the individual DC subsets. BDCA-1+ and BDCA-3+ DCs internalized most surface DEC205 by 30 min, with up to 80% of surface DEC205 being internalized within 90 min (Fig. 3A). Therefore, similar to primary murine DCs, human primary DCs exhibit fast DEC205 endocytosis, with high surface turnover. Analysis of CD11c endocytosis showed a similar pattern to murine DCs, where human blood BDCA-1+ and BDCA-3+ DCs displayed slow CD11c internalization with a low proportion of total surface CD11c being internalized. In this case, BDCA-1+ DCs internalized a significantly higher proportion of surface CD11c compared with BDCA-3+ DCs (Fig. 3B). In summary, DC receptors exhibit distinct internalization patterns under resting and activated conditions for both murine and human primary DCs. DEC205 and CD11c expressed by primary human DCs exhibit different internalization patterns. 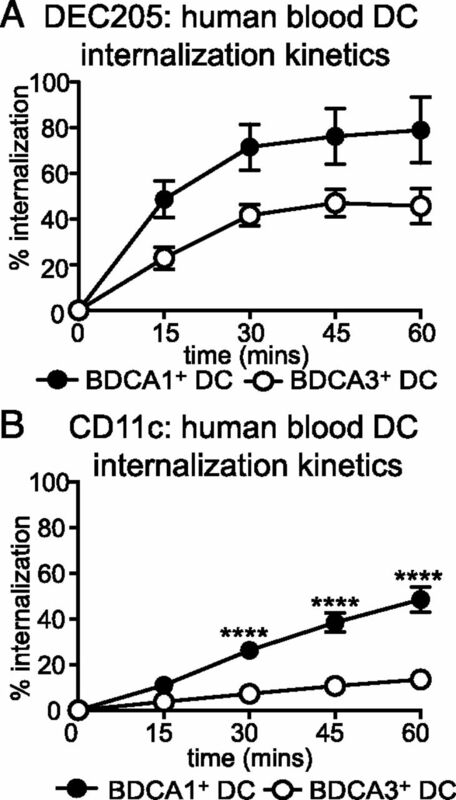 Internalization of (A) DEC205 and (B) CD11c was monitored with FIP for human blood BDCA-1+ and BDCA-3+ DCs. In all experiments, DCs were labeled with receptor-specific Abs conjugated to FIP at 4°C (time 0). At specific time points following culture at 37°C, cells were removed and exposed to QPC. DCs were phenotyped as described in Materials and Methods. Percentage internalization is calculated as the FIP signal at a given time point in the presence of QPC (minus signal elicited at time 0 with QPC) as a percentage of the signal at time 0 in the absence of QPC (minus signal elicited at time 0 with QPC). Graphs represent six individual donors (mean ± SD). Data were analyzed by two-way ANOVA followed by Bonferroni multiple comparisons. ****p < 0.0001. A major advantage of FIP internalization analysis is that it can provide quantitative measurements of the relative amount of internalized receptor. We therefore determined the relative Ag load delivered by DEC205, CD11c, and CD40. Despite the low percentage of surface turnover and slow internalization kinetics (Fig. 2B) after 90 min of internalization, CD11c delivered higher Ag load to immature CD8+ DCs compared with DEC205 (6-fold) or CD40 (35-fold) (Fig. 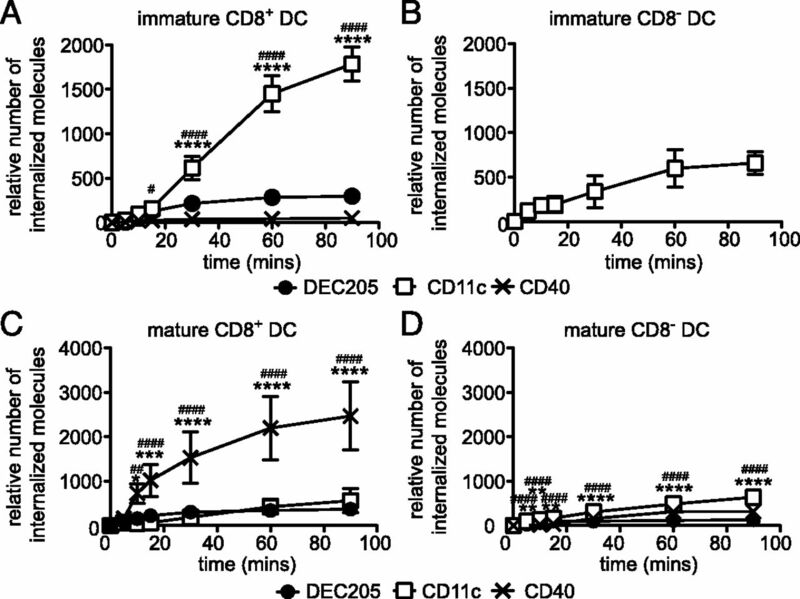 4A) and to mature CD8− DCs compared with DEC205 (5-fold) and CD40 (2-fold) (Fig. 4D). In contrast, for mature CD8+ DCs CD40 was the superior route by which to deliver more Ag to the cell interior. In this case, CD40 delivered >4-fold higher amounts of Ag compared with DEC205 and CD11c after 90 min of internalization (Fig. 4C). Therefore, despite being the receptor delivered with higher speed and surface turnover (Figs. 2, 3), targeting DEC205 was not superior in terms of the Ag load delivered. Targeting different DC receptors delivers different Ag loads. The relative number of DEC205, CD40, and CD11c molecules delivered to (A) immature CD8+ DCs, (B) immature CD8− DCs, (C) mature CD8+ DCs, and (D) mature CD8− DCs was determined using FIP. DCs were labeled with receptor-specific Abs conjugated to FIP at 4°C (time 0). At specific time points following culture at 37°C, cells were removed and exposed to QPC. Relative number of internalized molecules is calculated as the signal in the presence of QPC minus the background signal elicited at time 0 in the presence of QPC. Quantitation has been normalized to account for the individual labeling efficiencies determined for each Ab–FIP conjugate. Graphs represent pooled data from two independent experiments performed in triplicate (mean ± SD). Data were analyzed by two-way ANOVA followed by Bonferroni multiple comparisons. *p < 0.05, **p < 0.01, ***p < 0.001, ****p < 0.0001, CD11c relative to DEC205. #p < 0.05, ##p < 0.01, ####p < 0.0001, CD11c relative to CD40. To assess how receptor surface turnover, speed of internalization, and delivered Ag load dictate MHC I and MHC II Ag presentation outcomes, we targeted model Ag OVA for DC delivery via DEC205, CD40, and CD11c that exhibited clear differences in their internalization parameters and Ag load delivered. Ag presentation outcomes were assessed using 1) mature CD8+ DCs, where CD40 delivered higher Ag load (Fig. 4C), and 2) mature CD8− DCs, where CD11c delivered higher Ag load (Fig. 4D). Assays were performed with CD8+ and CD8− DCs sorted to purity by flow cytometry. Ag was delivered with biotinylated Abs specific for DEC205, CD11c, or CD40, followed by incubation with anti–biotin-specific Abs conjugated to OVA (9). MHC I and MHC II Ag presentation was measured by coculture of Ag-targeted DCs with Cell Trace Violet–labeled OVA257–264-specific CD8+ OT-I and OVA323–339-specific CD4+ OT-II T cells, respectively. The number of dividing OVA-specific T cells in the cultures was determined by flow cytometry after ∼64 h. For MHC I Ag presentation, targeting DEC205 expressed by CD8+ DCs elicited superior outcomes compared with CD11c or CD40 (Fig. 5A). This was also the case for CD8− DCs although the overall response generated was significantly lower relative to CD8+ DCs (Fig. 5B). For MHC II Ag presentation, both CD11c and DEC205 initiated effective presentation following targeting of both mature CD8+ (Fig. 5C) and CD8− DCs (Fig. 5D). Receptor-targeted mature CD8− DCs were more effective at MHC II Ag presentation compared with CD8+ DCs (Fig. 5C, 5D). Surface turnover, speed of internalization, and delivered Ag load do not dictate MHC I or MHC II Ag presentation outcomes. (A, C, E, and G) Purified mature CD8+ DCs or (B, D, F, and H) mature CD8− DCs were labeled with biotinylated Abs specific for (A–D) DEC205, CD11c, or CD40 followed by OVA-conjugated anti-biotin Abs or (E–H) anti-biotin Abs. Ab-targeted DC were pulsed with (E and F) OVA257–264 peptide or (G and H) OVA323–339 peptide. Ag-targeted DCs were titrated and cocultured with Cell Trace Violet–labeled (A, B, E, and F) OT-I or (C, D, G, and H) OT-II T cells for 64 h. Flow cytometry was used to determine the number of dividing T cells. Graphs represent mean ± SD of normalized data pooled from two to three independent experiments performed in triplicate. Data were analyzed by two-way ANOVA followed by Bonferroni multiple comparisons. ***p < 0.001, ****p < 0.0001, DEC205 relative to CD11c. #p < 0.05, ##p < 0.01, ###p < 0.001, ####p < 0.0001, DEC205 relative to CD40. One possibility that could explain the T cell proliferation outcomes is that the individual Abs were differentially activating their cognate DCs. This could result from the inherent ability of individual surface molecules to signal DC maturation following Ab engagement (29) or due to variable endotoxin levels in the Ab preparations. Ideally, for cross-presented Ag, we would measure appearance of H-2Kb–OVA257–264 complexes at the cell surface as a direct readout of Ag presentation. Unfortunately, the anti-H-2Kb–OVA257–264 (25-D1.16) Ab (30) is not sensitive enough to detect the low levels of H-2Kb–OVA257–264 complexes generated in these setting (Supplemental Fig. 3). Therefore to control for altered DC maturation, Ab-targeted mature CD8+ or mature CD8− DCs were pulsed with OVA257–264 or OVA323–339 peptides and OT-I and OT-II responses, respectively, were measured. In this case, Ab-targeted DCs elicited similar OT-I and OT-II T cell responses irrespective of the receptor targeted (Fig. 5E–H). This indicates that the targeted DCs were unlikely to be differentially activated. To further confirm this, we examined the cell surface profiles of the individual receptor-targeted DCs. Levels of CD80, CD86, MHC I, and MHC II were similar for DEC205, CD40, or CD11c-targeted mature CD8+ and CD8− DCs (Supplemental Fig. 4). Therefore, the different Ag presentation outcomes are due to differential Ag trafficking associated with the individual receptors rather than DC maturation state. In summary, the amount of Ag delivered did not correlate with Ag presentation efficiency for either MHC I or MHC II Ag presentation. CD40 delivered higher amounts of Ag to mature CD8+ DCs (Fig. 4C), but it was inferior, relative to the Ag load delivered, at eliciting both MHC I and MHC II Ag presentation (Fig 5A, 5B). 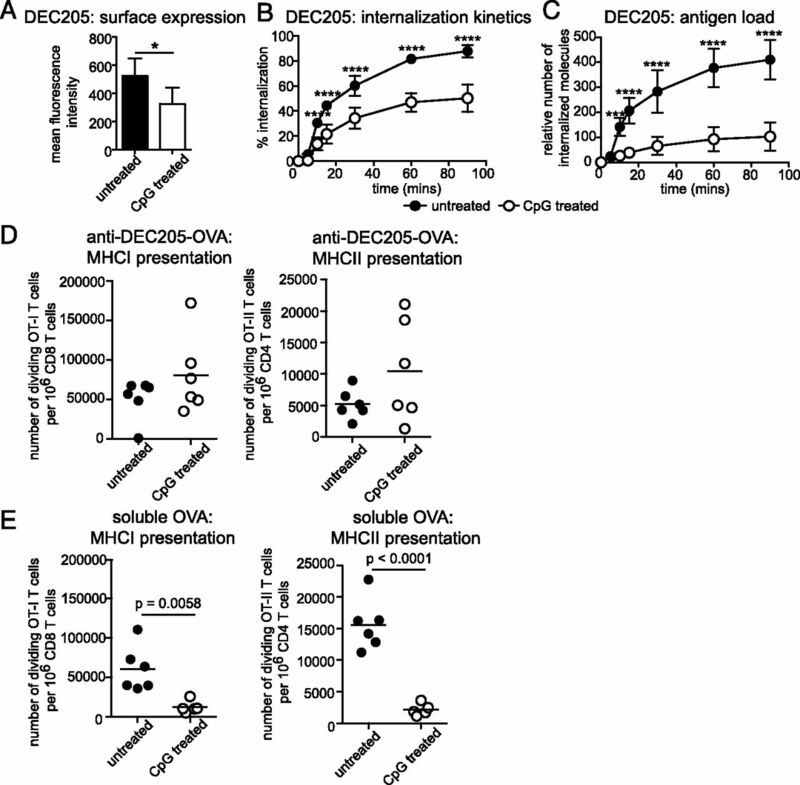 CD11c was as efficient as DEC205 at facilitating MHC II presentation for mature CD8− DCs (Fig. 5D), yet it delivered significantly more Ag (Fig. 4D). Furthermore, there was no obvious correlation between receptor internalization speed and/or surface receptor turnover with MHC I or MHC II Ag presentation outcomes. DEC205 enables Ag delivery to activated DCs that have otherwise shut off key mechanisms of Ag uptake such as phagocytosis (9, 31). Ab-targeted vaccination can therefore be exploited clinically to induce immunity in situations where excessive DC activation renders DCs incapable of responding to new challenges (32, 33). To further investigate this, we measured parameters of DEC205 endocytosis under conditions of in vivo inflammation. CD8+ DCs were isolated from mice undergoing systemic inflammation following i.v. injection of 20 nmol 1668 CpG 24 h previously. DEC205 expression levels were significantly lower on CD8+ DCs isolated from CpG-treated, compared with untreated, mice (Fig. 6A). DEC205-FIP analysis showed that CD8+ DCs isolated from CpG-treated mice displayed a significantly reduced proportion of surface DEC205 molecules internalized, whereas the speed of internalization was not altered (Fig. 6B). Furthermore, the delivered Ag load was significantly reduced with only low amounts of DEC205 delivered to the cell interior under conditions of inflammation, relative to steady-state conditions (Fig. 6C). Therefore, significantly less DEC205 internalization occurs under conditions of systemic inflammation. Inflammation reduces DEC205 endocytosis but does not impair the ability of DEC205 to elicit efficient Ag presentation in vivo. (A–C) DCs were isolated from untreated mice or mice that had received 20 nmol CpG i.v. 24 h previously. CD8+ DCs were analyzed for (A) DEC205 expression levels. Graph represents pooled data from three independent experiments performed in triplicate (mean ± SD). *p < 0.05, Mann–Whitney t test. (B and C) DEC205 internalization was measured by FIP. DCs isolated from untreated or CpG-treated mice were labeled with anti–DEC205-FIP at 4°C (time 0). At specific time points following culture at 37°C, cells were removed and exposed to QPC. DCs were phenotyped with Abs specific for CD11c and CD8. Graphs display DEC205 internalization for CD8+ DCs. Graphs represent pooled data from two independent experiments performed in triplicate (mean ± SD). Data were analyzed by two-way ANOVA followed by Bonferroni multiple comparisons. ***p < 0.001, ****p < 0.0001. (D and E) C57BL/6 mice were i.v. injected with 20 nmol CpG (○) or left untreated (●). One day later mice received 0.5 × 106 CFSE-labeled OT-I or OT-II T cells and (D) 1 μg anti–DEC205-OVA or (E) 100 μg soluble OVA. For OT-I T cells, spleens were harvested 3 d after OVA administration and dividing OT-I T cells were enumerated by flow cytometry. For OT-II T cells, spleens were harvested 4 d after OVA administration and dividing OT-II T cells were enumerated by flow cytometry. Data were pooled from two independent experiments; bar represents mean. Data were analyzed by an unpaired Student t test. Next, we investigated whether impaired DEC205 internalization following in vivo DC activation altered its effectiveness as a receptor for Ag targeting in vivo. To do this, we inoculated CpG-treated or untreated mice with 1 μg anti-DEC205 Ab conjugated to the model Ag OVA. Ag presentation outcomes following DEC205 Ag targeting were compared with those where mice received i.v. inoculation of soluble OVA protein. Ag presentation by MHC I or MHC II was monitored by i.v. adoptive transfer of CFSE-labeled OVA257–264-specific CD8+ OT-I T cells or OVA323–339-specific CD4+ OT-II T cells, respectively. The number of dividing OT-I and OT-II T cells was not significantly different following anti–DEC205-OVA administration to untreated versus CpG-treated mice (Fig. 6D). This contrasted to responses elicited by soluble OVA that generated significantly reduced MHC I and MHC II Ag presentation in CpG-treated mice (Fig. 6E). Therefore, despite the significant reduction in DEC205 internalization observed under conditions of inflammation, DEC205 continues to elicit efficient MHC I and MHC II Ag presentation outcomes in vivo. To our knowledge, we have for the first time provided quantitative information regarding parameters of Ab-targeted vaccination and determined how they dictate MHC I and MHC II Ag presentation outcomes. First, we established that the receptor-targeted DCs, but not nontargeted DCs, were indeed the major cell type responsible for Ag presentation. Next, internalization parameters of DC receptors were measured and exploited in settings of Ab-targeted Ag delivery. We identified DC receptors that displayed strikingly distinct receptor levels, internalization speeds, surface turnover, and delivered different Ag loads to the cell interior. In contrast to previous suggestions (2, 5), speed of receptor/Ag internalization and/or surface turnover did not influence MHC I or MHC II Ag presentation outcomes. Furthermore, definitive measurements of Ag load showed that intracellular Ag acquisition does not dictate MHC I or MHC II Ag presentation efficiency. In contrast, Ag presentation outcomes were enhanced when specialized DC subsets were targeted, highlighting the differential capacity of murine DC subsets to promote specific Ag presentation pathways. Finally, despite a significant reduction in DEC205 internalization under inflammatory conditions, efficient Ag targeting can proceed in vivo without a subsequent reduction in CD8+ or CD4+ T cell priming. Measuring the speed of internalization for individual DC receptors, we showed that DEC205, Clec9A, and CD40 possess fast internalization speeds, whereas CD11c and CD11b enter the cells more slowly. This supports previous reports of fast DEC205 loss from the cell surface of murine DCs (9) and human DCs (34), as well as analysis of DEC205 expressed as a fusion protein with CD16 (4). Studies with human blood DCs show DEC205 to be more rapidly lost from the cell surface of BDCA-1+ DCs compared with BDCA-3+ DCs (6), whereas our measurements indicate that BDCA-1+ and BDCA-3+ DCs internalize DEC205 at similar rates. Fast surface internalization was also observed for C-type lectin Clec9A, although this was significantly slowed by DC activation. High surface turnover of Clec9A supports previous data obtained with fl3L bone marrow–derived DCs (35). Enhanced surface internalization may be specific to all C-type lectins given it is a desirable attribute for pathogen receptors. CD40 was previously suggested to be slowly internalized (5), but this had not been definitively examined. Murine CD40 FIP analysis showed that similar to DEC205 and Clec9A, CD40 is internalized at a fast speed. In contrast, CD11c and CD11b integrins are internalized slowly by both murine and human DCs. BDCA-1+ DCs were the most active DC subtype in terms of surface CD11c internalization, albeit at a similarly slow rate. This may reflect a differential requirement for CD11c function in this DC subtype, with CD11c implicated in diverse roles from phagocytosis to cell migration. Although CD11c exhibited slow internalization, this receptor was not superior at generating MHC I and MHC II Ag presentation outcomes, relative to the faster internalized receptors DEC205 or CD40. Again, these data do not support the notion that slowly internalized receptors are more effective at MHC I cross-presentation (2, 5). Indeed, we see no correlation between the speed of receptor internalization and MHC I or MHC II Ag presentation outcomes. Both CD40 and DEC205 are internalized at fast speeds, yet DEC205 is significantly more efficient at eliciting MHC I or MHC II Ag presentation. Therefore, speed of receptor internalization can be excluded as a critical determinant of Ab-targeted vaccination. In the present study, FIP enabled quantitative measurements of the number of molecules delivered to the cell interior in primary cells without drug treatment or cell permeabilization. Previous studies of Ag delivery via individual DC receptors supported the notion that the amount of Ag delivered does not dictate Ag presentation efficiency (5, 6). In the present study, we confirm this with quantitative measurements of internalized Ag load that have not been performed previously. DEC205 delivered the same or less Ag load compared with CD40 or CD11c, yet it emerged as the most efficient receptor by which to deliver Ag for both MHC I and MHC II Ag presentation relative to Ag load. Conversely, CD40 delivered a higher Ag load to mature CD8+ DCs, yet it was an inefficient receptor with which to target Ag for MHC I and MHC II Ag presentation. Therefore, it is clear that Ag load is not the overall determinant indicative of Ag presentation efficiency. Extending our studies of DEC205 endocytosis to in vivo settings, we observed significantly reduced DEC205 endocytosis by DCs that were isolated ex vivo from CpG-treated mice. This confirmed reports by others of reduced DEC205 endocytosis following DC activation (34). Our laboratory has previously reported enhanced loss of DEC205 from the cell surface following DC activation and wrongly interpreted this as enhanced DEC205 internalization (9). In the present study, the use of FIP methodology to directly monitor the appearance of internalized DEC205 molecules has enabled us to clarify that enhanced loss of DEC205 from the surface does not result in increased DEC205 internalization and therefore likely results from elevated shedding of receptor and/or anti-DEC205 from the cell surface under activated conditions. This highlights the usefulness of FIP and illustrates the caution required when interpreting assays that measure loss from the cell surface as a readout for internalization. Despite significantly reduced DEC205 endocytosis in settings of inflammation, CpG-treated mice elicited similar MHC I and MHC II Ag presentation outcomes following inoculation with anti–DEC205-OVA compared with untreated mice. Therefore, the intracellular trafficking of DEC205-targeted Ag may be so efficient that effective Ag presentation ensues despite the significantly reduced Ag load. Alternatively, factors such as enhanced costimulatory molecule expression and/or enhanced cytokine production that accompany DC activation may overcome the reduction in DEC205-mediated Ag delivery. It is of interest whether similar observations are detected following in vivo administration of other agents known to elicit inflammation or whether this is specific to conditions provoked by CpG administration. This remains to be tested. A significant parameter capable of influencing Ag presentation outcomes in the setting of Ab-targeted vaccination is the specific DC subset targeted with Ag. In this study, we show that Ag delivered via DEC205 expressed by mature CD8+ DCs significantly enhances MHC I Ag presentation compared with DEC205 expressed by mature CD8− DCs. Although CD8− DCs receive a lower Ag load via DEC205 compared with their CD8+ DC counterparts, this supports a large body of evidence that CD8+ DCs possess specialized attributes that enhance the efficiency of MHC I cross-presentation relative to other DC subtypes (36–38). For human DCs, although there is less specialization between DC subsets for MHC I cross-presentation of soluble Ag (5, 28, 39, 40), BDCA-3+ DCs emerge as superior cross-presenters of Ag that can access the late endosomal compartments (6). This suggests that access of cross-presentation by Ab-targeted vaccination requires selection of a targeted receptor that is expressed by more specialized cross-presenting DC subtypes. For MHC II Ag presentation, we observed murine CD8− DCs to be the superior cell type for facilitating this pathway, supporting previous observations (41). Therefore, DC specializations play an important role in dictating Ag presentation outcomes, and consequently the expression patterns of Ag-targeted receptors are likely to be critical in determining the nature of the immune response generated. In summary, the efficiency of Ab-targeted vaccination is ultimately the result of an array of factors. In this study, with definitive quantitative analysis, we have excluded receptor expression levels, surface turnover, speed of Ag internalization, and Ag load as major determinants of either MHC I or MHC II Ag presentation outcomes. In contrast, the specializations of DC subsets targeted with Ag do contribute to targeted vaccine outcomes. In the present study, we have solely relied on the use of OVA as a source of Ag for presentation. Ags other than OVA are presented following receptor targeting including HIV Gag (8, 42, 43) and human epidermal growth factor receptor 2 (44, 45), highlighting the usefulness of Ab-targeted vaccination in settings of infection and cancer immunotherapy, respectively. We propose that findings identified in the present study are relevant to any Ag that is internalized via a specific receptor. The receptor targeted, rather than the associated Ag, is likely the critical determinant of Ag presentation outcomes. This remains to be tested directly with clinically relevant Ag. In conclusion, identifying which parameters do or do not dictate Ag presentation is important if the mechanisms responsible for this process are to be exploited in the setting of Ab-targeted vaccines to allow tailored and robust vaccination outcomes. This work was supported by National Health and Medical Research Council of Australia Project Grant 1062549 (to A.P.R.J. and J.D.M. ), Australian Research Council Future Fellowship FT110100265 (to A.P.R.J. ), a Monash Larkins Fellowship (to A.P.R.J. ), Agence National de la Recherche Grants ANR-10-IDEX-0001-02 PSL* (to E.S. ), ANR-11-LABX-0043 (to E.S. ), and Centre d'Investigation Clinique Institut Gustave Roussy-Curie 1428 (Center of Clinical Investigation) (to E.S. ), and by INSERM (to E.S.).
. 2014. IL-6 trans-signaling-dependent rapid development of cytotoxic CD8+ T cell function. Cell Reports 8: 1318–1327.
. 2014. Dendritic cell-targeted vaccines. Front. Immunol. 5: 255.
. 2000. The dendritic cell receptor for endocytosis, DEC-205, can recycle and enhance antigen presentation via major histocompatibility complex class II-positive lysosomal compartments. J. Cell Biol. 151: 673–684.
. 2013. Antigen delivery to early endosomes eliminates the superiority of human blood BDCA3+ dendritic cells at cross presentation. J. Exp. Med. 210: 1049–1063.
. 2007. DEC-205 receptor on dendritic cells mediates presentation of HIV gag protein to CD8+ T cells in a spectrum of human MHC I haplotypes. Proc. Natl. Acad. Sci. USA 104: 1289–1294.
. 2013. Targeting antigen to bone marrow stromal cell-2 expressed by conventional and plasmacytoid dendritic cells elicits efficient antigen presentation. Eur. J. Immunol. 43: 595–605.
. 2007. Distinct pathways of antigen uptake and intracellular routing in CD4 and CD8 T cell activation. Science 316: 612–616.
. 2011. Targeting DC-SIGN via its neck region leads to prolonged antigen residence in early endosomes, delayed lysosomal degradation, and cross-presentation. Blood 118: 4111–4119.
. 2009. Antibody to Langerin/CD207 localizes large numbers of CD8α+ dendritic cells to the marginal zone of mouse spleen. Proc. Natl. Acad. Sci. USA 106: 1524–1529.
. 2002. Anatomic location and T-cell stimulatory functions of mouse dendritic cell subsets defined by CD4 and CD8 expression. Blood 99: 2084–2093.
. 2013. A programmable sensor to probe the internalization of proteins and nanoparticles in live cells. Angew. Chem. Int. Ed. Engl. 52: 5744–5748.
. 2012. The dendritic cell receptor Clec9A binds damaged cells via exposed actin filaments. Immunity 36: 646–657.
. 2012. F-actin is an evolutionarily conserved damage-associated molecular pattern recognized by DNGR-1, a receptor for dead cells. Immunity 36: 635–645.
. 2009. Identification of a dendritic cell receptor that couples sensing of necrosis to immunity. Nature 458: 899–903. 2002. Integrins: bidirectional, allosteric signaling machines. Cell 110: 673–687.
. 1990. The distinct leukocyte integrins of mouse spleen dendritic cells as identified with new hamster monoclonal antibodies. J. Exp. Med. 171: 1753–1771.
. 2008. CD11c provides an effective immunotarget for the generation of both CD4 and CD8 T cell responses. Eur. J. Immunol. 38: 2263–2273. 2002. Role of the lectin domain of Mac-1/CR3 (CD11b/CD18) in regulating intercellular adhesion. Immunol. Res. 25: 219–227.
. 2010. The XC chemokine receptor 1 is a conserved selective marker of mammalian cells homologous to mouse CD8α+ dendritic cells. J. Exp. Med. 207: 1283–1292.
. 2010. Human CD141+ (BDCA-3)+ dendritic cells (DCs) represent a unique myeloid DC subset that cross-presents necrotic cell antigens. J. Exp. Med. 207: 1247–1260.
. 2012. Characterization of resident and migratory dendritic cells in human lymph nodes. J. Exp. Med. 209: 653–660.
. 1998. Help for cytotoxic-T-cell responses is mediated by CD40 signalling. Nature 393: 478–480.
. 2010. Mature dendritic cells use endocytic receptors to capture and present antigens. Proc. Natl. Acad. Sci. USA 107: 4287–4292.
. 2006. Systemic activation of dendritic cells by Toll-like receptor ligands or malaria infection impairs cross-presentation and antiviral immunity. Nat. Immunol. 7: 165–172.
. 2007. 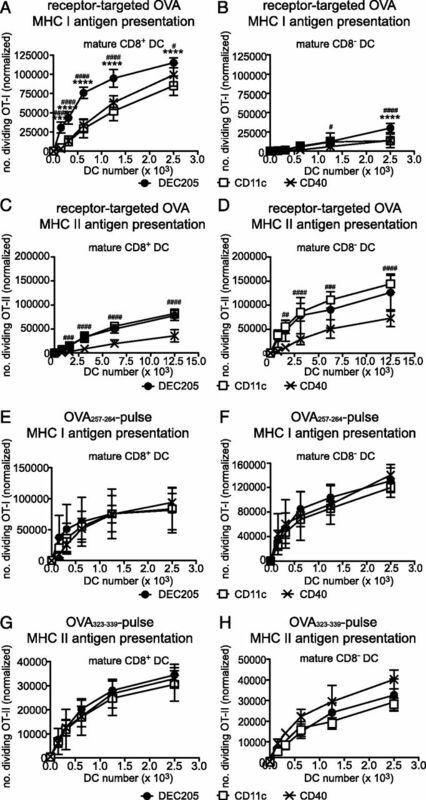 Dendritic cell preactivation impairs MHC class II presentation of vaccines and endogenous viral antigens. Proc. Natl. Acad. Sci. USA 104: 17753–17758.
. 2007. Altered expression and endocytic function of CD205 in human dendritic cells, and detection of a CD205-DCL-1 fusion protein upon dendritic cell maturation. Immunology 120: 362–371.
. 2011. Human dendritic cell subsets from spleen and blood are similar in phenotype and function but modified by donor health status. J. Immunol. 186: 6207–6217.
. 2013. Similar antigen cross-presentation capacity and phagocytic functions in all freshly isolated human lymphoid organ-resident dendritic cells. J. Exp. Med. 210: 1035–1047.
. 2010. Route of antigen uptake differentially impacts presentation by dendritic cells and activated monocytes. J. Immunol. 185: 3426–3435.
. 2011. Immunization with HIV Gag targeted to dendritic cells followed by recombinant New York vaccinia virus induces robust T-cell immunity in nonhuman primates. Proc. Natl. Acad. Sci. USA 108: 7131–7136.
. 2012. Treml4, an Ig superfamily member, mediates presentation of several antigens to T cells in vivo, including protective immunity to HER2 protein. J. Immunol. 188: 1147–1155.